Questo articolo non è ancora disponibile. Se prenoti ora, effettueremo la consegna non appena arriverà. 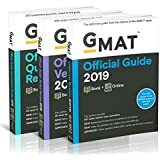 The GMAT Official Guide 2020 Bundle includes the GMAT Official Guide 2020, GMAT Official Guide Verbal Review 2020, and GMAT Official Guide Quantitative Review 2020 and gives test takers access to the ultimate GMAT preparation tool in one package. GMAT Official Guide 2020 is the definitive study guide from Graduate Management Admission Council, the makers of the GMAT exam. It contains over 1,000 real GMAT questions from past exams with detailed answer explanations that provide insight on how to approach each question from the prospective of the test maker. 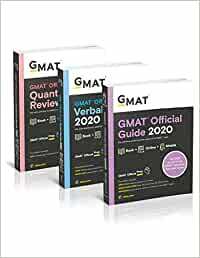 The GMAT Official Guide Verbal Review 2020 and GMAT Official Guide Quantitative Review 2020 include more focused exam prep for the verbal and quantitative portions of the GMAT exam with more than 300 additional questions not available in the GMAT Official Guide 2020. You’ll also get access to the GMAT Online Question Bank, customizable study tools, and a new mobile app for practicing on the go – even when you’re not connected to the internet. Preparation pays off. Optimize your study time and get the most from your GMAT preparation with the GMAT Official Guide 2020 Bundle! This product includes three print books with a unique code to access the GMAT Online Question Bank and mobile app.